Don't worry about feeling lonely whilst you're there!! Unless you are staying in private hotel rooms and ordering room service every night, you are bound to cross paths with lots of other people, many of whom are in the same situation. I became really good friends with the people I was living with, despite only spending a few weeks with them. (Coincidentally, this weekend I'm actually travelling to London to meet up with a group of the people I met whilst travelling!) So, if feeling lonely whilst out there is holding you back - don't let it! Start conversations with people. 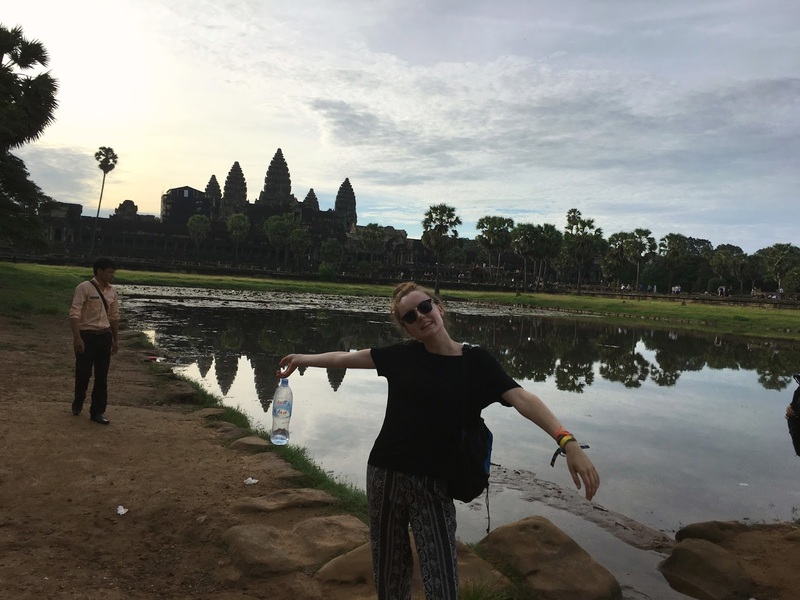 Whilst in a hostel in Siem Reap, I was talking to a friend I'd made out there about our plans to visit Angkor Wat (featured in the above photo) the next day. A guy in the hostel overheard this conversation and said he was keen to see the temples too... So, I invited him along and soon 3 became 4. He was a solo traveller also and quickly became part of our group for that weekend. So much so that we then took him with us to all the other things we did that weekend... None of the above would have happened if he hadn't started that conversation. Be extra cautious. There definitely is safety in numbers, so, when doing anything that could be considered risky take extra precautions... For example, don't go wandering the backstreets of a city late at night, and don't accept deals that seem way too good to be true. Both of the aforementioned situations could be perfectly harmless, but when travelling on your own it is important to be alert. Keep in touch with people at home. Now, this might sound like a given but it's really important to let people at home know what you're doing and what's going on. I tried to message home once a day, just with a quick update to say that I was alright and my plans for the day etc. This meant that when I visited islands that had absolutely no signal/wifi, people at home weren't worried when I disappeared off the radar for 3 days. Confidence: fake it til you make it. Even if you're totally unsure of what you are doing it's a good idea to not let it show. Firstly, because acting confident has been shown many times to lead to an increased feeling of confidence. And, also, looking like a rabbit caught in the headlights can lead people to take advantage of this and charge you more for things, ask you to pay for things that aren't necessary and just agree to things you wouldn't usually. So, fake it baby, fake it. Do you have any tips for solo travellers? I love to solo travel, and these are definitely tips I live by when travelling by myself. I like staying at hostels because it is such a great way to meet other travellers. I've never volunteered, it sounds like a great thing to do!